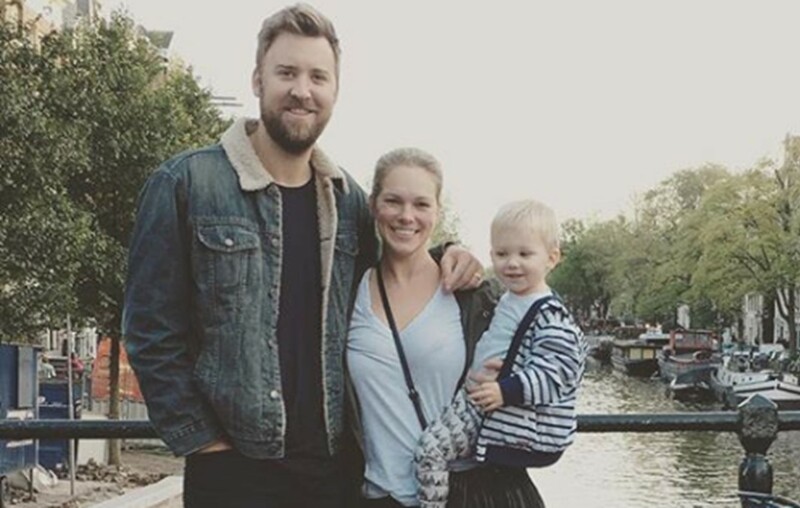 Lady Antebellum's Charles Kelley has fully embraced touring the world with his son, Ward, and wife, Cassie. More on the trio here! Lady Antebellum‘s Charles Kelley admits that his son Ward has seen more in his 2 and half years of life than he did his first twenty. Charles grew up in Augusta, Georgia where he spent his summers working on his dad’s farms located in the North Georgia Mountains. There he would spend his days raising cattle and riding around on the tractor each and every day. With his country lifestyle, Charles never imagined he’d travel outside of the United States let alone Georgia. At Thanksgiving one year when he was younger, Kelley sat down for a meal made for 75 family members where he listened to one of his cousins talk about an expedition he had taken to China. And even though there is no place like home, once Charles joined Lady Antebellum and began touring with his family, he began to change his mind where he even admitted that he’d love to retire somewhere like Positano, Italy. He then talks about traveling with his family and the wonderful experience it truly is. When Charles is circling the globe for his tours he loves to bring his wife Cassie and son Ward. Charles estimates that his young toddler has been on over 100 flights and has visited several countries around the world. Even though Ward may be too young to process all of this, Charles says that he is still a “sponge” and is very aware of his surroundings. In a recent trip to Amsterdam, Kelley said that his son was “enamored” by the sea of bike riders zooming by. “I still love the South, I love Georgia, but there’s just so much beauty in the world,” Kelley reflected. Charles says his son is currently in the stage where he copies everything his dad does, and since Charles loves golfing, he purchased Ward a mini set of golf clubs so they can play together on the course. Not to mention that Ward Charles is a complete rockstar like his dad. Looks like Charles isn’t the only one who is tour ready! Ward Charles and Kelley even got tattoos in the same place on their arm! Of course, Ward Charles’ is only temporary… for now. We can see that Kelley is already the father of the year as Ward Charles debuts his first hit single on his dad’s Instagram. This family serves nothing but love, laughter, and talent. This is Ward’s new hit thanks to some clever editing by @russelled #birthdaytime And no it’s not his birthday it’s just what he decided he wanted to sing. You’re welcome world! Join the Lady Antebellum family on the road this summer on their Summer Plays On Tour with co-headliner Darius Rucker and special musical guest Russell Dickerson. Make sure to share this with other Lady Antebellum fans!